The third Release of Danke Goncalves. It´s an epic story about a frail Character. 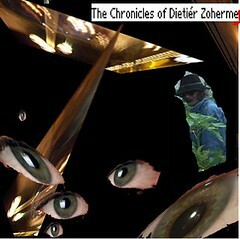 His name: Dietiér Zohermes. Nobody knows him. He´s a forgotten man. He even forgets himself most of the time. He is running away, that´s for sure...Bur nobody knows what he is running away from. Once(long time ago...must´ve been in the seventies or early eighties), Dietér was a student of Philosophy and Fine Arts...Maybe it has to do with this. Or with his parents who had strange behaviours. Nobody knows. What is for sure: He is on the run. And he is somehow not conscious of what hes doing. It seems that since that day he slept in the wood and ate those mushrooms he picked up from the ground(cause he was hungry and had nothing to eat) he is on a constant trip. And in his youth he must´ve listened to music from woody guthrie. That´s for sure. This Man is really mysterious...Nobody knows whats happening inside his mind. Very super-spannend. Here's a review from a friend: "wischiwaschiwuschi"